The Cicons.—The Fruit of the Lotos-tree.—Polyphemus and the Cyclops.—The Kingdom of the Winds, and God Aeolus's Fatal Present.—TheLaestrygonian Man-eaters. 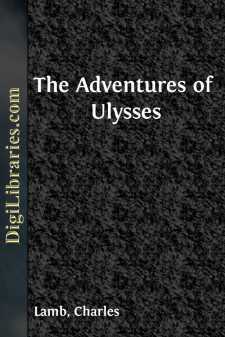 This history tells of the wanderings of Ulysses and his followers in their return from Troy, after the destruction of that famous city of Asia by the Grecians. He was inflamed with a desire of seeing again, after a ten years' absence, his wife and native country, Ithaca. He was king of a barren spot, and a poor country in comparison of the fruitful plains of Asia, which he was leaving, or the wealthy kingdoms which he touched upon in his return; yet, wherever he came, he could never see a soil which appeared in his eyes half so sweet or desirable as his country earth. This made him refuse the offers of the goddess Calypso to stay with her, and partake of her immortality in the delightful island; and this gave him strength to break from the enchantments of Circe, the daughter of the Sun. From Troy, ill winds cast Ulysses and his fleet upon the coast of the Cicons, a people hostile to the Grecians. Landing his forces, he laid siege to their chief city, Ismarus, which he took, and with it much spoil, and slew many people. But success proved fatal to him; for his soldiers, elated with the spoil, and the good store of provisions which they found in that place, fell to eating and drinking, forgetful of their safety, till the Cicons, who inhabited the coast, had time to assemble their friends and allies from the interior; who, mustering in prodigious force, set upon the Grecians, while they negligently revelled and feasted, and slew many of them, and recovered the spoil. They, dispirited and thinned in their numbers, with difficulty made their retreat good to the ships.